We are proud to announce the publication of our first book of the 21st century, Journey through Astrology. This book launches our new venture, the Faculty of Astrological Studies Press, and we hope it will be the first of many Faculty publications showcasing our approach to contemporary astrology, our work and our ethos as a school. We think this first book is particularly special, because it charts the journey a person takes when they discover astrology and embark on a serious study of it. 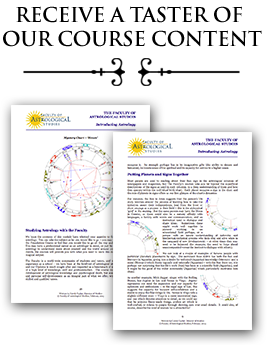 The book is thus of relevance and interest to all our students and to anyone involved in learning, teaching or working with astrology, whether formally-trained or self-taught. As anyone who has been involved with astrology for any length of time will appreciate, our subject has the power to bring about profound changes in each of us, through showing us a vision of the cosmos in which we are participants rather than observers, through engagement with powerful archetypal symbols, and by connecting us to the unique talents and individuality of our own birth chart. Within one integrated narrative arc, the book presents the accounts of ten authors who have all taken this journey themselves and can attest to both its challenges and its wonder. We have chosen the centaur as the Faculty Press symbol, evoking the wisdom of Chiron as teacher and mentor. Like the centaur, astrology forms a bridge between two worlds, the realm of ordinary life and the realm of the imagination, where we engage with astrology’s ancient symbols. We hope through the FAS Press to offer, in the upcoming years, many books which will be both practical and inspiring, and which encapsulate the power and beauty of this priceless art. The book will be officially launched at 7.10pm BST on Wednesday 17th June 2015 in London. You can buy it from The Atlantis Bookshop, the Astrology Shop and Midheaven Books. It will also be available soon via Amazon and Waterstones, with other stockists to follow. To find out more about the Journey through Astrology, click on the tab to your left.